Massive clearance sale, we are clearing the shelves and taking all sale items out! Are you ready for the biggest sale in the city? Everything is ready for the traditional shopping mania in Ramstor Mall known as Garage Sale. From February 7th until February 12th 2017, all prices in Ramstor Mall shall be up to 70% off while the stores will offer its customers a wide selection of top brands items, high quality and great fun which will make your shopping a very enjoyable and valuable experience. This would be a unique opportunity for you to fully renew your clothes or buy new sports equipment, quality shoes, and accessories or get various household items at a discount. The supermarket located in the Mall will traditionally take part in this campaign by offering awesome promotions and mega reductions to all visitors. Get ready because the shopping madness will last for six days when all roads should mandatory lead to your favourite shopping destination. Please come and experience the massive clearance sale, we are clearing the shelves and taking all sale items out! 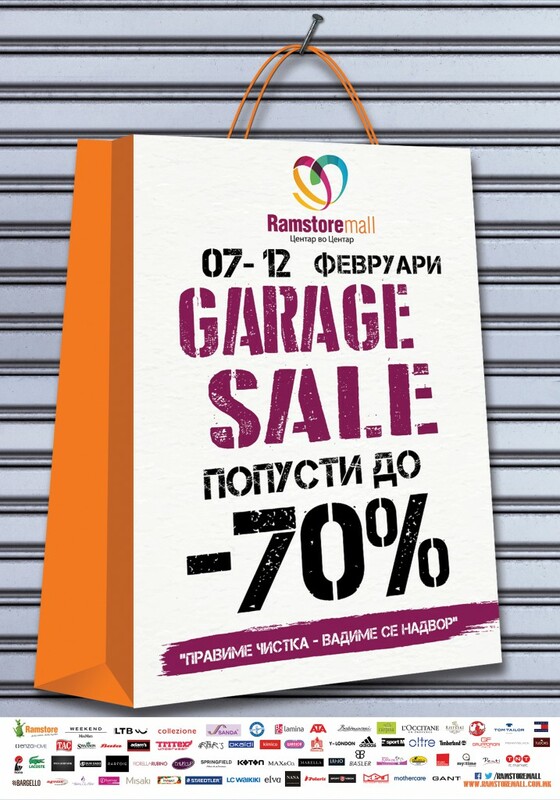 From February 7th until February 12th – Garage sale in Ramstor Mall!